It wasn’t the first time the presidential candidate had a tussle with the media. After taking a closer look, it appears Trump’s enterprising war on the media began very early in his campaign. 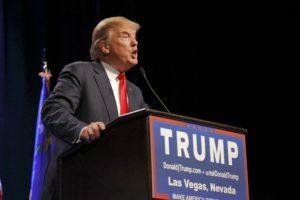 Republican presidential candidate Donald Trump speaks at campaign event at Westgate Las Vegas Resort & Casino the day before the CNN Republican Presidential Debate. 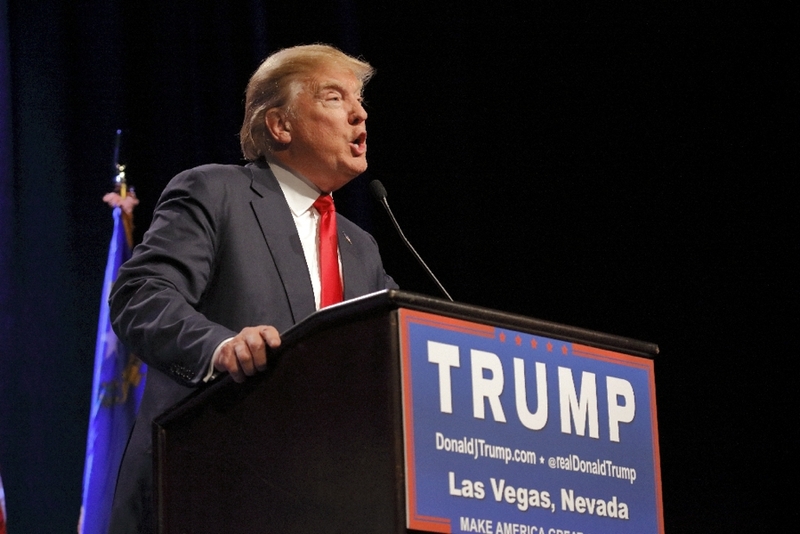 As a result, Trump chose not to participate in the final Republican debate before the Iowa Caucus hosted by Fox. Instead, he held his own event in support of veterans in an attempt to draw ratings away from the debate. Fox’s Trump-less debate had 12.5 million viewers between 9 and 11 p.m., according to Nielsen and was the network’s second lowest rated GOP debate of the season. In February, Senior TIME White House photojournalist, Christopher Morris was choke-slammed to the ground by a Secret Service Agent at a Trump rally in Virginia. Morris said he was attempting to leave the press box, a designated area for photographers, in order to snap photos of “Black Lives Matter” protesters who were being escorted out of the rally. The incident was captured in numerous cell phone videos widely available on the internet. The United States Constitution’ First Amendment protects the Press. In fact, it’s one of the only countries in the world that gives citizens a right to freedom of speech. The amendment states that laws which infringe upon the freedom of the press are prohibited. There are of course certain federal laws that restrict media outlets from publishing untrue and false information that could damage a person’s reputation. These laws are called libel laws. They are meant to protect people whose reputations have been damaged as a result of negative publicity through defamation. The most common act of defamation is mistaken identity or when a newspaper publishes a story about an individual who committed a crime, but they use the wrong names of people involved. Their name, picture and other personal information gets published; this usually happens as a result of careless reporting and lack of fact checking. But if Trump were to become president and change federal law, he could technically sue any news outlet over the smallest act of defamation no matter how outrageous he acts in the public eye; making the uncomfortable exchanges between him and Megyn Kelly and the incident involving the Secret Service agent who chokeslammed the photographer, and all the other recent acts of violence at his rallies seemingly disappear from the headlines. He could do this by passing an executive order. Housatonic Political Science professor Matthew Dunne believes it would be no easy task for the presidential hopeful. “I don’t think Trump would ever get legislation through Congress on this issue if he became president, and I believe if he passed an executive order he would open himself up to the possibility of impeachment and the Supreme Court would ultimately find it unconstitutional,” Dunne said. According to Dunne, most of the regulations that are in place regarding libel laws are not really concerned with the press ruining someone’s reputation, unless it’s a clear case of libel or slander; which is one of the main reason Trump wants to change the law. He said rather, the focus has shifted to evidence-based reporting and issues related to plagiarism. “ Publishing rumors as fact or un-sourced material is now largely looked down upon, and if a media outlet runs a story without doing its due diligence and fact-checking it might have to run an apology, correction or retraction, which can have very real consequences on the reputation of a newspaper or an individual reporter. But if a story is factual and a media outlet has evidence to back up their coverage, the reputation of the person being covered isn’t really an issue,” Dunne said. When it comes to Trump’s remarks about changing the law, Dunne said Trump is acting out of defense, and it’s not uncommon for politicians to defend themselves against the media. Dunne believes all the negative publicity against Trump is not necessarily hurting the GOP front runner’s campaign. “I think that a lot of the media coverage of Trump has had a negative impact on his reputation with the general electorate. However, with his target demographic it appears that, if anything, the negative publicity has only strengthened his appeal. I think this is due to a number of factors, including the fact that many members of his target demographic distrust traditional media, so they’re skeptical of negative press coverage to start with. A lot of his appeal is based on his ‘unfiltered’ public persona, which turns many people off but also holds great appeal for his supporters,” he said. libel laws in the U.S. The 65-minute audio recording is available on the newspaper’s website.